Antojito Jones – Searching from jungle to big city markets for classic Mexican snacks like Carne Asada Tacos, Crispy Sopes, and Blue Corn Quesadillas. Chorizo Hunter – “The Bacon of Mexico,” this famous Mexican sausage is not as complicated as you might think. Rick makes Chorizo-stuffed Ancho-Chiles. Color on the Palate – Rick takes us on a technicolor adventure in Mexico that’s all about how color is an inextricable part of the landscape, the culture, the art and the food. Lime Pie, Prickly Pear Sauce and tostadas. Tropical Cool – An adventure in Acapulco, the great international resort that’s making a major comback. Traditional poolside Banana Daiquiris, refreshing Shrimp Cocktail, Choconuez Ice Cream, and tropical Ice Pops. Savoring Sundays – The best Mexican Sunday traditions – Crispy Pork Carnitas, Chicken in Escabeche, and whimsical hot cakes in the Coyoacan Square. Chorizo, the fresh pork sausage, has been called “the bacon of Mexico.” Rick’s quest to find the best chorizo takes him to the remote mountain town of Tenancingo, where he explores the market and investigates what it is about this place that makes its sausage products so tasty. He also uncovers another local tradition, the making of the intricately hand-woven shawls known as rebozos, Along the way, Rick shows us how to make Chorizo-Stuffed Ancho Chiles and we even get a lesson in making Chorizo at home from scratch.Chiles en Nogada, a chile stuffed with a sweet-savory pork and fruit picadillo filling, topped with a blanket of snow-white fresh walnut sauce and a scattering pomegranate seeds. Rick tracks down the seasonal ingredients for this stunning dish and recreates it at home for an independence day dinner, Chicago style. 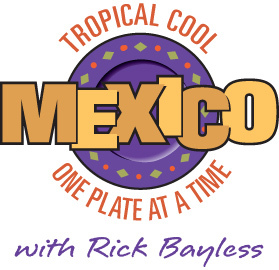 Escaping from a bleak, snowy Chicago day, Rick takes us on a technicolor adventure in Mexico that’s all about how color is an inextricable part of the landscape, the culture, the art and the food—from market stalls that sell a rainbow of tropical fruit to an aguas stand with brightly hued juices on display. We join Rick as he checks out the striking color palette of one of Mexico’s great treasures of modern architecture, the Camino Real Hotel. In his Chicago kitchen, Rick shows us how to make easy Aguas as well as spectacular Tostadas with Black Beans, Radishes and Lettuce with Tomatillo Salsa and a Lime Pie with a bright splash of Prickly Pear Sauce. The Bayless family is celebrating Deann’s birthday. In honor of the occasion, Rick has decided to make the first dish he ever cooked for Deann: Pork in Adobo. Then it’s time to think about the birthday present—and we’re off to Taxco, the world-renowned silver capital of Mexico. We join Rick as he makes his way into the mountains, explores the narrow streets of this breathtaking colonial town, and investigates the colorful history of silver in Taxco, from the time of the Spanish conquest through the elegant, ultra-modern work of today’s silversmiths. At a local family-style restaurant, Rick introduces us to a local specialty,Green Pozole, a rich hominy soup, and we learn to make it at home. We end up back in Chicago for a festive birthday dinner. As he watches Acapulco’s famous La Quebrada divers leap off a cliff into the sea, Rick contemplates thrill-seeking, and confides that he gets his culinary kicks from the thrill of the chile. So he sets out in search of chile thrills—a quest that takes him from a simpleMichelada made with beer and hot sauce to a chile field, a chile vendor, a spicy Shrimp a la Diabla eaten on the run in an Acapulco market, a lesson in preparing Homemade Hot Sauce, and the ultimate chile thrill: a soulful fish adobado, cooked over coconut husks in a simple palapa restaurant overlooking a tropical lagoon. Is there a “silver bullet” that can make us healthy and feeling full of vitality? Rick’s on a quest to find out. Will he find it at the stall of a vendor of exotic herbal remedies? In a simple bowl of seafood soup? In his own recipe for Chilpachole, a soup made with crab and chiles? In a detoxifying mud mask in the town of Coyuca? His quest ultimately takes him to the fruit and vegetable aisles of the pristine La Merced Market in Mexico City, where he makes sense of the quest for health and eternal youth: it’s all about moderation, balance and eating fresh foods. From there, Rick takes us to his own beautiful garden for some tips on growing your own produce—and he gathers the ingredients to make a healthy, richly flavorful vegetable stew, Pipian Verde de Verduras. We find Rick in the main square of Acapulco on Spetember 15th, the eve of Mexican independence day, as a crowd of thousands comes together to shout “Viva Mexico” and they join in the traditional independence day celebration known as the grito. No Mexican dish is more emblematic of the holiday than the red white and green Chiles en Nogada, a chile stuffed with a sweet-savory pork and fruit picadillo filling, topped with a blanket of snow-white fresh walnut sauce and a scattering pomegranate seeds. Rick tracks down the seasonal ingredients for this stunning dish and recreates it at home for an independence day dinner, Chicago style. Rick sets out in quest of the story of corn, one of Mexico and Central America’s greatest gifts to the world. We join him as he follows corn from a corn field in the Mexican countryside to a mill, where field corn is hulled and ground into masa, to a small factory, where the masa is made into tortillas. Just outside the factory, those still-warm tortillas are transformed into delectable steak tacos at a tiny open-air stall. Then it’s on to a local tamaleria for a look at how masa becomes tamales with all kinds of exotic fillings—and Rick shows us the secrets to making Fresh Corn Tamales at home. At a cafeteria, he muses on Crema de Elote, the rich Mexican corn chowder, then shows us how to make it in Chicago. And finally, he tracks down one of his favorite street snacks, elote asada, Grilled Corn, and demonstrates the fine points of corn grilling in his backyard kitchen. Some people go trekking in search of wildlife. Rick will go to any length in search of great food. We find him boating down a river in the midst of a tropical jungle. He’s got a “jones” for antojitos, the class of Mexican snacks designed to satisfy every culinary whim. The search takes him on a cross-country tour of masa-based antojitos, from crispy sopes in the tropical town of Coyuca to streetside carne asada Tacos in the heart of Mexico city; Blue Corn Quesadillas stuffed with fresh cheese and squash bloosoms and Tlacoyos with Salsa Roja, stuffed with beans in an open-air market; lamb tacos in a tiny market stall, huaraches (giant open-faced masa cakes) at the entrance to a Mexico City subway station; andGorditas with Salsa Negra, which Rick prepares with his friend Carmen at El Bajio, her Restaurant in Mexico City. Episode 9: What is Hip? Rick’s spent a lifetime exploring the hallowed traditions that make Mexican culture and cooking so rich and varied. Today, though, he’s on a mission to show us the other side of Mexico—the side that’s deliciously and unashamedly hip. At Mexico City’s hottest new restaurant, Izote. he explores how chefs are turning traditional ingredients into cutting edge new dishes—in much the same spirit as he does at his restaurant, Topolobampo. 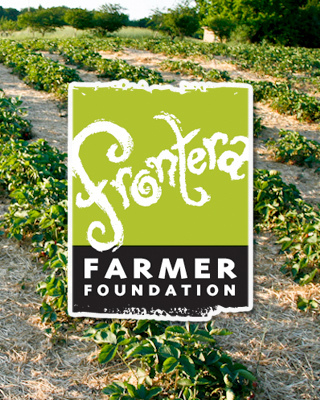 He takes a look at some of the hottest “new” Mexican ingredients, like huitlacoche, the “corn mushroom” that’s been called the truffle of Mexico, and squash blossoms, which he shows us how to grow in your own garden—and how to turn into sophisticated Squash Blossom Crêpes. We get a look at the trendy side of tequila, and learn how to make fresh, contemporary Grilled Fish with Heirloom Tomato Salsa. And when it comes to Mexican hip, he shows us that food is just the beginning, as we join him on a search for the coolest treasures hidden in one of the country’s most famous artisan crafts markets and one of Mexico City’s favorite home décor stores. What is hip? For Rick, it’s all a question of context. And in the end, it turns out to be a very Mexican idea after all. Rick’s on an adventure in Acapulco, the great international resort that’s making a major comeback. The weather’s balmy here all year, and he’s in search of the best ways to get cool quick. He starts with an impromptu chilled mango as he drives into town. Then it’s time for a visit to the 17th-Century Fort of San Diego and a look at how the port of Acapulco was once one of the most important trading centers in the world—the hub for the Manila Galleons, that brought the riches of Asia and changed the world of cooking forever. In Acapulco’s old town, Rick reflects on the city’s heyday as a resort for the rich and famous of old Hollywood, checks out two of Acapulco’s coolest traditions—the banana daiquiri and the swim-up bar—and indulges in a refreshing shrimp cocktail. Finally, he meets up with his daughter Lanie, and they seek out the best frozen treats the town has to offer, from exotic ice creams to shaved-ice raspados (with demonstrations of how to make Rick’s own versions at home). It’s hotter than ever in Acapulco…and getting cooler by the minute. By a campfire in the Mexican high-plains dessert, Rick invites us to join him as he searches for the origins of chili con carne. Is it Mexican or Southwestern? The stuff of cowboys or grandmothers? Chili begins with chiles, so Rick takes us from a chile field to a chile stall to his own garden to see how chiles are grown and dried. After a quick detour to examine a collection of fiery folk-art devils, we check out tamales—their filling is, essentially a kind of chili—at a Mexico city tamleria and meet a Mexican grandmother for a lesson in making a slow-cooked stew that ends up looking quite familiar. Following that lead, Rick preparestwo sensational chilis—one made with pork, the other with lamb and pasillas—in his home kitchen for a cozy chili party with friends and family around the fireplace. We find Rick on a Sunday morning in a plaza in front of a beautiful baroque church in the mountains of Mexico as he sets out to search for the best Mexican Sunday traditions, starting with carnitas—the rich, golden, slow-fried pork that’s a once-a-week indulgence all over the country. We visit a huge open-air restaurant, Arroyo, in Mexico City to see it being made, and Rick shows us his own simplified technique for preparing Carnitas at home. A visit to a museum is a Sunday tradition the world over, and we join Rick for a trip to the Frida Kahlo House, where the celebrated artist lived with her equally famous husband, Diego Rivera. Every room in the house is itself a work of art, especially the kitchen, where Rick talks about the fabulous party feasts Frida and Diego enjoyed here. Back in Chicago, he recreates some of these specialties at home. His pursuit of Sunday’s best continues in nearby Coyoacan Square, where everyone meets for Sunday treats—including whimsical hotcakes, artfully poured onto the griddle to make an edible portrait of each customer. Vacationing in the opulent Las Brisas resort overlooking the Bay of Acapulco, Rick and his family decide to throw an impromptu party—right in their hotel room. At the colorful Acapulco market, they round up party props, flowers and everything they need to makeBruschetta Mexicana with Queso Fresco, Mint and Black Pepper; Guacamole with Tostadas and Sliced Radishes; Shrimp Salpicon on Crispy Chalupita Cups; Fruit Kebabs with Honey and Granola, Homemade Margaritas, and Limeade. Along the way, Rick stops at a wine store for a look at the best of Mexican wines. Shot entirely on location, the preparations all come together without a kitchen—tasty proof that with a little improvisation, you can make a party out of anything.